The second edition of this must-have reference covers power quality issues in four parts, including new discussions related to renewable energy systems. 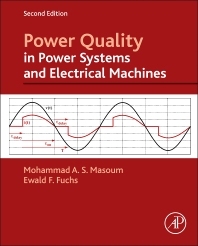 The first part of the book provides background on causes, effects, standards, and measurements of power quality and harmonics. Once the basics are established the authors move on to harmonic modeling of power systems, including components and apparatus (electric machines). The final part of the book is devoted to power quality mitigation approaches and devices, and the fourth part extends the analysis to power quality solutions for renewable energy systems. Throughout the book worked examples and exercises provide practical applications, and tables, charts, and graphs offer useful data for the modeling and analysis of power quality issues. 1.1 What criterion is used to select the sampling rate (see line 500 of two-channel program [81, chapter 2])? 1.2 What criterion is used to select the total number of conversions (line 850 of the two-channel program [81, chapter 2])? 1.3 Why are the two-channel program dimension and the array for the channel number not used for the five-channel program [81, chapter 2]? 1.4 What is the criterion for selecting the multiplying factor in step 9 (0.004882812 ≈ 0.004883) for the two- and five-channel configurations? 1.5 Why is in step 9 of the two-channel program (line 1254) the array either DA(n + 10) or DA(733), and in the five-channel program (line 1233) the array is DA(368)?